Kongsberg, Norway, 16 January 2018 – Kongsberg Maritime has renewed its supplier agreement with electronics manufacturer and technical services provider Norautron for the next three years, with a further two year option. The deal, with a potential value up to NOK 1 billion, builds on 29 years of existing co-operation and will support KONGSBERG to continue development of new, reliable and state-of-the-art marine technology that meet the needs of its diverse global customer base. Delivered through a network of technical and manufacturing facilities in Norway, Sweden, Poland and China, Norautron’s prototyping, industrialisation and manufacturing services are important to KONGSBERG’s ability to design, build and test new technology, and ensure that it is available in the market when it is needed. “We are very pleased that Norautron has once again proven to be competitive in this global tender. Norautron combines local presence with a global supply chain set-up that suits our operational set-up. 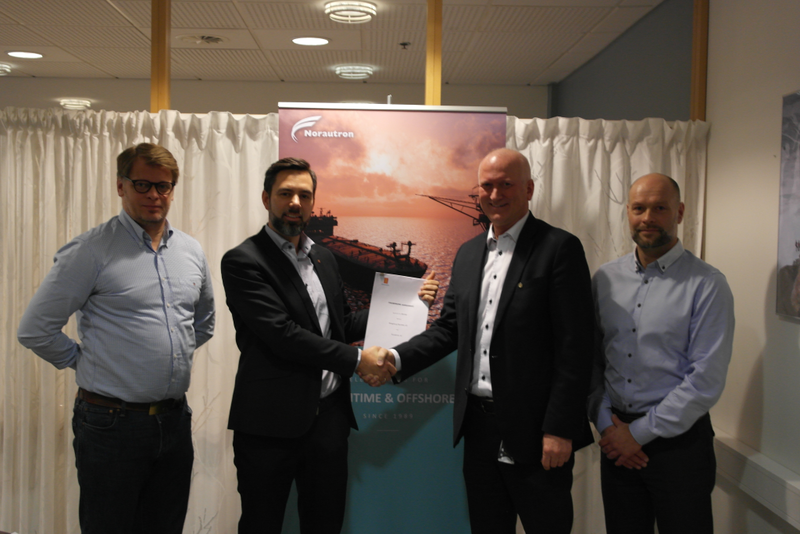 We look forward to the continued collaboration and the value it will bring to our customers and end-users,” said Frode Kaland, EVP Global Supply Chain, Kongsberg Maritime. “Norautron is very satisfied with the trust KONGSBERG has given us. Kongsberg Maritime is a demanding customer with world leading technology and products that require world class suppliers. We are proud to continue our working relationship, and look forward to being part of KONGSBERG’s future success,” says Øyvind Sedivy, President & CEO Norautron. Norautron AS, a part of EMBRON Group, is a leading manufacturer of electronics. The company has production facilities in Norway, Sweden, Poland and China, provides services within test development, prototyping, PCBA, electro-mechanics and advanced system building. Norautron is headquartered in Horten. The company has 700 employees and revenues of 1 billion NOK. We deliver systems for dynamic positioning and navigation, marine automation, safety management, cargo handling, subsea survey and construction, maritime simulation and training, and satellite positioning. Our solutions enhance efficiency and safety throughout the whole maritime technology spectrum and we offer additional competence in providing turnkey engineering services within the shipbuilding and floating production sectors. EMBRON provides a broad portfolio of Technology Solutions, R&D and Engineering services and Manufacturing services to customers within diverse market segments including marine, offshore, defence, automotive, medical, retail, manufacturing, finance, air traffic control and transportation. Through deep industry knowledge, EMBRON provides solutions and services that are tailored to the exact needs of each market and customer. The main EMBRON companies are Norautron, Hatteland Display, Elektronix, GuardREC and QRTECH. Revenues in 2016 were approx. NOK 1.4 Billion, positioning EMBRON as one of the largest IT and technology companies in Norway. EMBRON has 17 offices in 9 countries and employs around 1000 people. The company is owned 100% by JC Broch AS, which is fully owned by Jørgen Cato Broch.